You will both win when you adopt Sarah. This girl, a lab/shep mix, was coaxed out of under a trailer in Eastern Wa. She has not known love but for the foster family who daily encourages her to leave her crate. Sarah is still young and having experienced shy ones like this many times before, she is a rose waiting to bloom. She needs someone who can put in the time and patience, and has experience and can build trust with her. Can you be the one and help? Sarah is running out of time and only has until Oct. 3. Please pass this along! She needs us and deserves a chance at a warm, loving home. She'll thrive! * I ONLY HAVE A FEW MORE DAYS ! Right now I am sitting in the shelter wondering if someone will help save me! 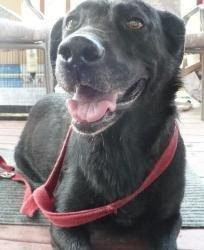 My name is Red Baron and I am a male Labrador Retriever and Rottweiler Mix. I am only 2 yrs old, weigh 70 lbs and a wonderful and handsome loving dog. I get along great with other dogs and people of all ages including kids!!! I will be neutered and up to date with all my shots if I am saved in time! I need a fenced in yard & would love to go to obiedience school to learn more commands. I was found as a stray and was lost until someone bought me to the shetlers. I am loyal, smart and will protect who ever adopts me. I HAVE BEEN RESCUED! IN THREE HOURS. 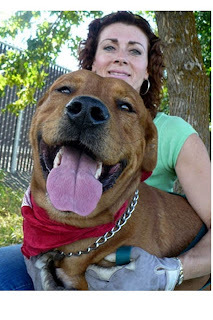 WAY TO GO DEBORAH AND HER LOYAL GROUP OF GOOD CITIZEN CANINES! A friend of mine recently rescued a stray pit bull/lab mix, but found it too much for her apartment. I have some space and time (a yard and a bit of vacation left) plus I'm a sucker, so I have taken him in for now. Diego is eager to please and very loving. He is also very active. Diego is still young, and learning quickly what is acceptable and what is off-limits (jumping, furniture, dining table, begging, my bedroom, etc). He has a GREAT personality. After 24 hours in my house, he appears to be housebroken and not destructive, even when left alone. Right now he would like to play, but is patiently napping. He will be fixed as of next week. I wish I could keep him, but my schedule is too busy and only one of my cats has the gumption to stand up for himself (the other is a chronic scaredy cat and spent the night hiding under a bush in the neighbor's yard waiting for the beast to go away). I'd be happy to speak with any interested parties- the sooner the better. I always enjoy seeing others creations. 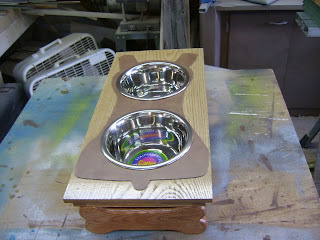 Larry makes one of our favorite type of items. 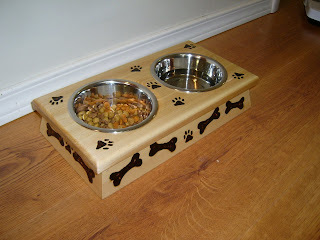 Hand crafted wooden dog bowls, leash holders, beds and many other items. 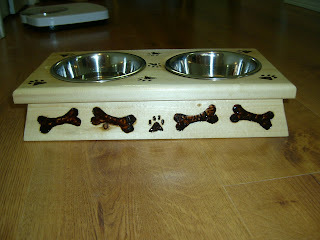 He is very talented and can custom create something special for your pooch. 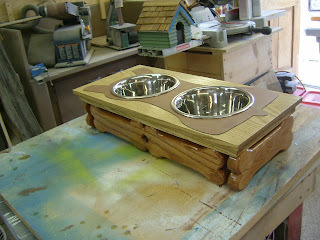 Check out these photos and the link to his other items.